The question of “Does North American soccer succeed in developing players?” is always a difficult one to answer. On one side, with the addition of Major League Soccer, it means thirty or so players make their professional debut each season, and a small handful are able to make pro debut for clubs in Europe or South America. On the other side, when soccer is talked about in the press, there is always the comparison of North America versus the rest of the world with Major League Soccer adding to this by saying they wish for the league to be competitive with the top leagues in the World by 2022. Traditionally in Europe, players compete in youth leagues with a similar format to the top divisions, with even the big clubs represented by teams as young as under eleven. Players compete in this system by the time they reach 17/18 years of age, and if they are good enough are offered a professional contract. However, most remain in a reserve league or on loan to a smaller club until they are able to make the first team, usually around 21 years of age. In Europe, youth and reserve leagues make sense since clubs are located fairly close to each other so travel isn't really an issue. By the time a player makes his professional debut he has already played hundreds of games, 1000's of hours of training, and has an awareness of how to react to most situations in a match. This has even expanded over the past couple years with European clubs seeing the value of youth development, especially with the proposed UEFA Financial Fair Play Regulations and including the addition of a continental UEFA Youth League similar to the UEFA Champions League as well as U21 leagues domestically in each country. As part of my work I have added these to the leagues I cover analytically and actually produced videos of the top prospect in these leagues and all the leagues I cover. These players, for the most part, are unknown to even the people in the city they play in, and the first thing you notice from these videos is despite the players’ age being 17 or 18, they look like the complete package, so much so that not only would most of them be regulars in MLS, but top players as well. This shows there is a huge gap between North America and leagues MLS feels they can be comparable with, and we might have to reconsider where we currently are in the world and what we wish the league to be. That being said, ignoring bad marketing and people who don't really understand the game, what MLS has provided is importantly a chance for players in North America to realistically develop a career in the game, which is only improving with expansion and should always be the main goal. MLS, in conjunction with the US Soccer Federation, is also trying to develop players and at least give them similar opportunities to those in Europe. The US Soccer Development Academy, unknown to most, is a league in North America that plays at the age groups of 17/18, 15/16 and now 13/14. Clubs play a regional 30 game schedule throughout the traditional winter soccer calendar, ending in a national playoffs. Both the Vancouver Whitecaps and Montreal Impact have teams in this league and MLS youth teams do well with the New York Red Bulls winning the 17/18 championship last year. Once a player graduates from this development league, there are the option of playing in University, PDL or start their pro career with the recent development of USL Pro being an MLS development league, including complete reserve teams fielded by the LA Galaxy and soon the New York Red Bulls and Seattle Sounders. Although it’s not the same level of standard, and further development needs to be done on the coaching and performance analysis, players who hope to one day play professionally can at least play a similar number of competitive games. Canadian Soccer has said that they want to do the same with a lot of talk, including the Easton report proposing the idea of a Junior league in Canada similar to what we already have in hockey. To be honest, and I imagine most Canadians feel the same, I'm quite cynical regarding soccer in Canada especially at the administration level. Personally, I've worked in the game for over fifteen years and my take it locally is I commend peoples’ effort, but the goals tend to be either unrealistic or produced half-heartedly, and after being knocked down a few times in the past I learned it hasn't been worth my time or hopes. This being said, more recent development have been encouraging, starting with the Toronto MLS franchise and the teams in Vancouver and Montreal, as well as NASL clubs in Edmonton and Ottawa, as well as the addition of new stadiums and general support, including 30,000 recently seeing a Women's National Team game in Winnipeg. 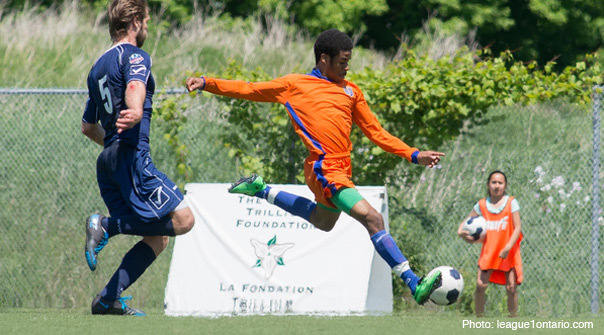 The recent addition to this is new youth leagues in Quebec and Ontario: The Premier League of Quebec, which started in 2012, and Ontario League One, who played their first games this past weekend. Again, cynical and a bit naïve, my expectations for this Ontario League One when first hearing about it was of an all-star league geared for high school aged players. This has some value, although realistically at that age, the level of play isn't overly competitive as the transition to a professional has yet to begin. With that said, I'm impressed the league has chosen to accept older players, including those who are currently at University or in the NCAA, and even players who have already graduated. This gap in age I think is a good thing, with older players knowing what is expected and needed to continue to play soccer at a high level, while the league should provide a real learning curve for the younger players and hopefully a boost in performance. The league also includes some real prospects, most notably Cyle Larin who is in my top 5 prospects when he chooses to enter the MLS draft, and is also a potential prospect for Europe. Larin will be playing for Sigma Academy, the club I believe is the one to watch as they also include Kwame Awuah, who I had in my All-Canadian NCAA team, former Toronto FC player Emery Welshman, as well as keeper Greg Ranjtisingh, outfield players Jordan Hibbert, Chris Nanco, Alex Hallis, Manny Morgado, Mark Wadid and Mark Gonzalez, who are all playing with NCAA Division 1 schools south of the border. Sigma FC is not the only team with NCAA Division 1 experience as ANB Futbol has Daniel Iannacito, who played four years at St Bonaventure; Durham has Jordan Dover who plays for Green Bay and Kyle Crichton at Northern Illinois; Vaughn has Alon Badat who plays for Bradley; and Windsor has Alex Mendonca who plays for Detroit. Meanwhile, the TFC Reserves, as I mentioned in my College recaps, has a number of players attending and playing at York including Mark-Anthony Kaye, meanwhile current York player and former TFC Academy player Jonathan Lao is playing for Vaughn. These are the players I'm aware of, although I imagine there is other comparable talent in the league and part of the league’s responsibility will be to showcase these players. Especially the younger ones, to allow them to get opportunities with top American universities, as traditionally this is how you are identified and get drafted/signed by an MLS Club. I recently wrote about the PDL and its key role in development of players and talked about the potential opportunity for Canadian talent, despite being caught up in mostly an American system. I wrote this without knowing the rosters of the Ontario League One, so now my view has changed and as long as leagues like League One can offer players the same opportunities and are committed to the cause, we should start seeing the rewards of this effort in the years to come.